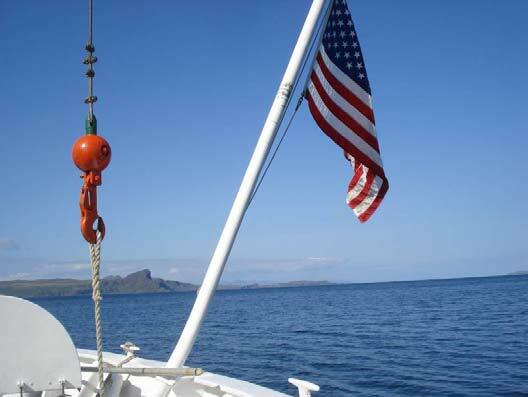 The life of a mariner can be summed up in two words: adventurer and problem-solver. For a hydrographer, the commute to work can be filled with more danger than driving down a busy interstate highway. Perils such as whales, rocks and other boat traffic can be ultimately more dangerous than avoiding road construction debris. However, for an adventurer, it is a chance to see the world and interact with nature. These scientists go out everyday in order to make our waterways safer. They go out seven days a week, often for three weeks at a time, rain or shine. They have to know about the interactions of weather and the ocean, how to fix computer and technological equipment, survival skills, basic first aid and radio communication. They live in small, shared spaces and function as a team. Many of the mariners I’ve met aboard the Rainier, can’t see themselves at any other kind of job! The stories they tell about how they came to be on board the Rainier suggest their adventuresome spirit. These are people used to doing things, being active and committed to making a difference in the world. For example, a seaman by the name of Hauerland is working on completing a documentary he created on the plight of homeless American Vets. Another seaman studies Japanese in order to be able to communicate with international seaman. It has indeed been a privilege to be allowed a glimpse of their world and to work beside them these last three weeks. As we pull into port at Seward, the adventure continues for some. On their free time, some are going sky-diving, some plan 12 mile hikes to a glacier and some join in a race up and down Mt. Marathon in Seward. Living life to the fullest is what it’s all about. 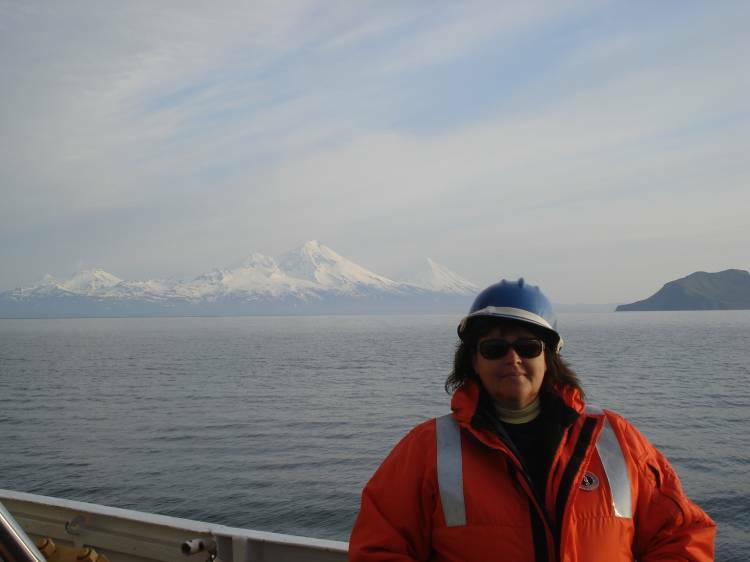 From the first day that I received word that I was accepted as a 2009 Teacher at Sea, I was excited to have the opportunity to work with real scientists in the field so I could share my experiences with my students. Then reality hit and I wondered if I would be seasick, if I would be able to understand what the scientists were doing, if I would find my way around the ship ok and if I would always be cold. Well, I never got sick, (thanks to the patch) the scientists explained everything they did…sometimes two or three times until I got it. I found my way around the ship easily, and wearing layers and my giant orange float coat kept me toasty. Never would I have imagined how quickly you could become attached and made to feel like part of a team. 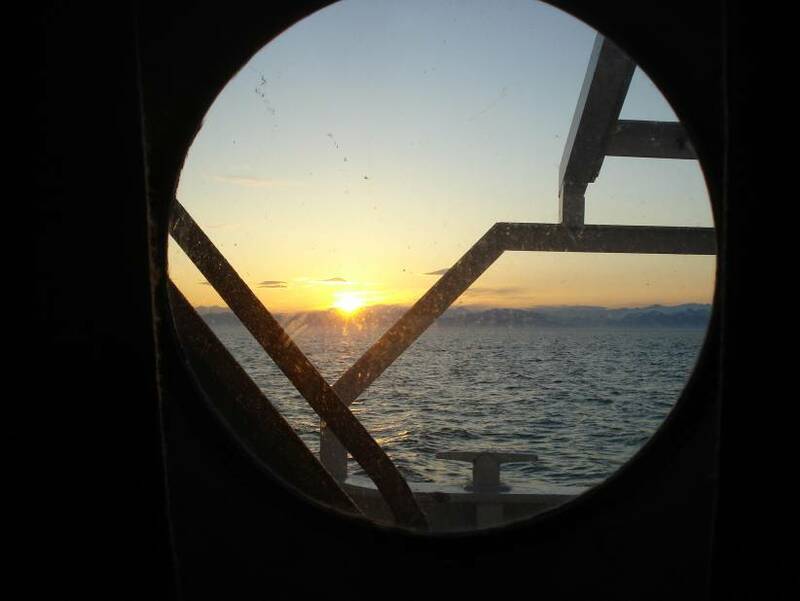 From the CO (Commanding Officer) who would sit and play guitar hero with the crew, to the NOAA Corp officers who answered millions of nautical questions, to the engineers who patiently explained how they kept our ship running, to the stewards who cooked favorites that kept you from being homesick, to the deckhands who made sure my short little legs got me across the great expanse of water when I leaped into the launch boats, and then taught me to drive a boat and even made me the best hot chocolate ever, and to the scientists who had to explain every step of what they were doing and then gave me chances to help (despite the fact that I could seriously mess up their data with just one mistake)… to them I say a heartfelt thank you for an opportunity of a lifetime. The only thing better than working on the Rainier is being a Teacher at Sea on the Rainier and having the chance to share this experience with my students, colleagues and friends back home. Science doesn’t just exist between four walls in laboratory. All scientists don’t wear white lab coats and have black-framed glasses. Science is an ever-changing, dynamic way to interpret our world. Science is EXCITING! 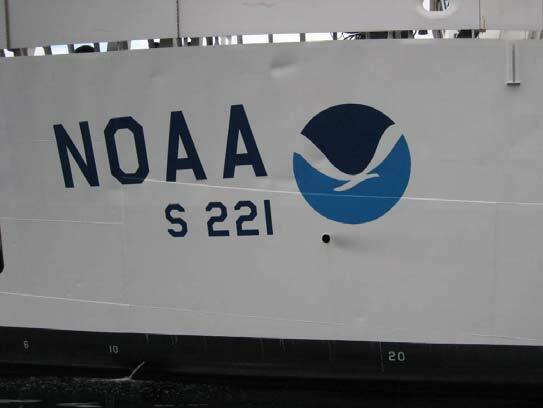 This entry was posted in 2009, Mary Patterson, NOAA Teacher at Sea and tagged Alaska, ensign, Hydrographic survey, multibeam sonar, noaa ship rainier. Bookmark the permalink.